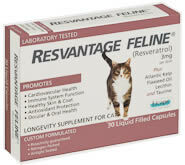 RESVANTAGE® IS THE HIGHEST QUALITY AND SAFEST RESVERATROL SUPPLEMENT ON THE MARKET TODAY and as the most trusted brand in the industry has received wide acclaim. This is why top physicians, naturopaths, and other leading health care professionals are using it in their practices. Here’s what sets RESVANTAGE® apart from the rest: We employ sophisticated technology developed by the pharmaceutical industry to prepare and encapsulate our resveratrol. This is out of the reach of most nutraceutical manufacturers and rarely employed for a natural product. 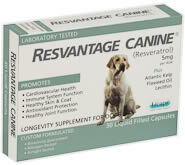 Resvantage is a pure organic resveratrol supplement made to pharmaceutical standards and thus is unique to the industry. SUNLIGHT ALSO DEPLETES THE BIOLOGICAL ACTIVITY OF RESVERATROL causing it to convert from the active trans form to the inactive cis form. 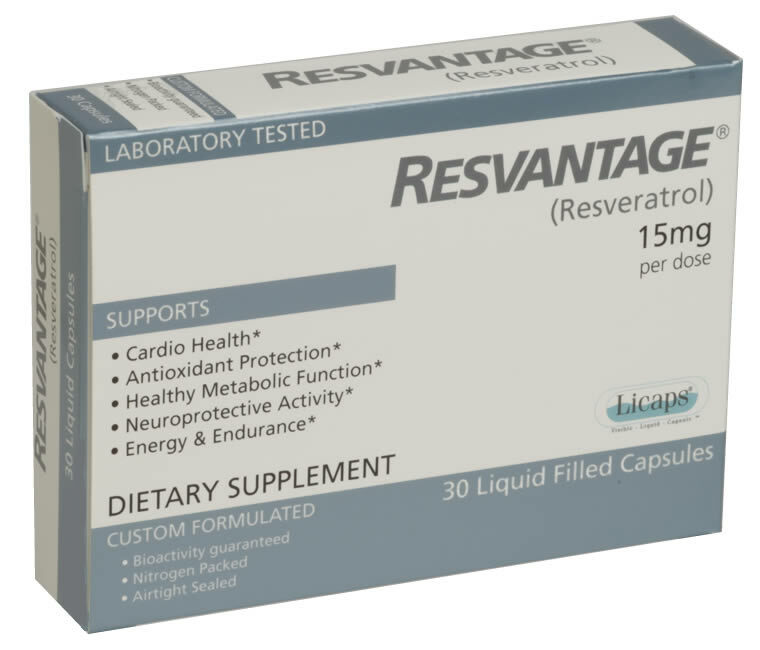 RESVANTAGE® capsules are opaque, which protects the active resveratrol in our capsules from losses due to exposure to light, an essential element in maintaining the potency of our supplement. Bioavailability is how well a supplement gets digested and absorbed in your body and it’s a major factor in whether you get the full benefit of the supplement. You can take all the resveratrol you’d like and it won’t do you much good if your body can’t absorb it. A liquid delivery system offers better bioavailability than solid forms and we utilize this together with the most advanced technology in the industry in the preparation processes leading up to encapsulation in order to enhance the absorption of RESVANTAGE® in the body. This is what makes the RESVANTAGE® supplement so effective at low doses while avoiding the potential long term negatives of high dose resveratrol supplementation. And recent clinical trials have shown resveratrol to be effective at low doses. According to the latest research published in the journal Public Library of Science One, a team of international researchers found that resveratrol is active in much LOWER DOSES than previously thought. Until now, researchers believed that high doses of resveratrol were necessary to ward off the ill effects of aging. Several clinical trials have demonstrated the efficacy of low dose resveratrol to mimic the favorable gene expression changes seen with caloric restriction and numerous studies have linked caloric restriction to a longer, healthier life. RESVANTAGE®, at 15 milligrams per capsule, provides the amount of resveratrol clinically proven for its biological effects. When you buy into an anti-aging program, you want to protect yourself around the clock. Pills wear off. According to the National Institute of Health, resveratrol has a 9.2 hour half-life in the system. The activity of resveratrol is to activate the SIRT1 longevity gene and put the body in a protective mode and you don’t want to be doing this for half the time or half the day. You want protection for the full day. And with RESVANTAGE®, because of its controlled low dose, you have the flexibility of taking it twice a day to keep a sufficient level of resveratrol in your system for constant gene activation while avoiding the potential long term negatives of high dose supplementation. RESVANTAGE® is a natural organic compound encapsulated for us at a pharmaceutical facility and the protocols that an ethical pharmaceutical company follow throughout the manufacturing process exceed, by far, those of a typical nutraceutical house. Our supplement is manufactured to cGMP* standards and meet a rigorous quality assurance program. It is lab tested during all phases of the process insuring that the active compounds are free of heavy metal toxicity and microbiological contaminants. A natural supplement manufactured to strict pharmaceutical standards is unique to the industry and a sound reason why you can rely on the safety and integrity of the RESVANTAGE® family of products. *current Good Manufacturing Practices – Production quality and safety assurance policies required by the FDA based on state-of-the-art pharmaceutical science. RESVANTAGE® is in a class by itself. A natural supplement made to strict pharmaceutical standards employing leading edge technology so you can rely on it for the things that matter; safety, potency and bioavailability. Its liquid delivery system has been designed to protect the efficacy of the formula and for fast and maximum absorption in the body. You care about your health and you don’t want to maintain it by trial and error. Most resveratrol supplements in dry powder form with their binders and fillers simply don’t work. With RESVANTAGE®, you get peace of mind of knowing you are getting a supplement of superior quality that does. All this makes RESVANTAGE®, the best value proposition on the market today. Just as in humans, supplements may be the best tool for maintaining the overall health of your pets and horses. 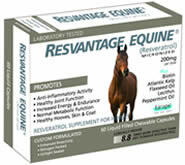 RESVANTAGE® companion pet and equine supplements contain non-grape sourced resveratrol blended together with a unique combination of nutrients that work synergistically to help them reach their full potential. WineRx Scientists have found Resveratrol slows down the aging process. Morley Safer reports..
©2007-2016 ADVANTAGE BIOSCIENCES, INC. All rights reserved.